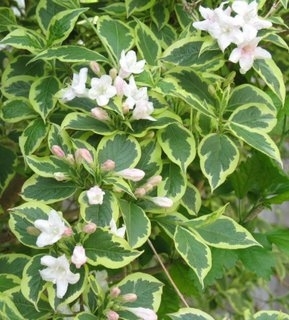 The Variegated Wiegela, Weigela florida 'Variegata', has a compact habit, growing 4-6' high and wide. It has grey leaves with yellow/cream fringes, and dark pink flowers. This deciduous shrub is grown for its showy bell-shaped flowers and spreading, arching growth habit. Leaves are dark green, oval and tapered, to 2.5 inches long. Dark pink flowers with pale pink-white interiors, to 1 1/4 inches long are produced in corymbs on short lateral twigs on previous years growth in late spring to early summer. Flowers are attractive to hummingbirds. Very nice in a mixed shrub border.